Rainy day nail art tutorial | Memorable Days : Beauty Blog - Korean Beauty, European, American Product Reviews. It has been raining a lot lately~ I got inspired by the rain and made this nail art ^__^ hope you like it! Btw. it might be disturbing that the lighting is different on the pictures =.=" sorry about that, I tried to get the same lighting on every picture, but the weather was a bit weird that day =(. Anyways, click on the link below to read the whole tutorial for this nail art. Step 2: Apply a grey nail polish on your nails. I've used a nail polish from Catrice; London's Weather Forecast #280. The color is blue/greyish as you can see on the picture. 1 layer is enough ;). After you've applied it, let it dry. Step 3: Make clouds (see picture) by putting 6 dots with your dotting pencil and fill it in. 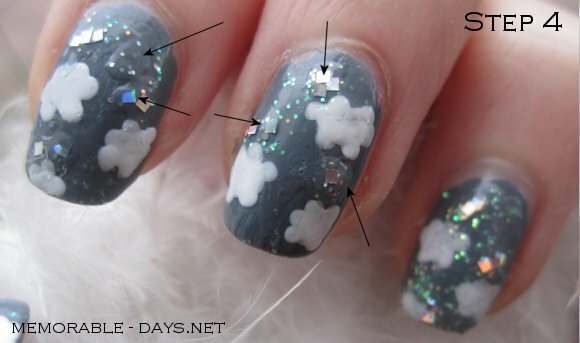 Step 4: Apply glitters, avoid the clouds and fill in the grey spaces with glitters. You can see that it doesn't look smooth, so you have to apply a top coat when the glitter nail polish is dry. Step 5: Apply a top coat, let it dry and you're done ;). - Step 3: Essence dotting pencil (pink) and Dear'Lee white nail polish. looks so cute♥ Need to try this, too! Thank youuu Sushi, Tasja, Prinzesschen, Marjolein and Vanity-Fashionista ^^.. !! @Melody, ahwww.. come to holland ='D and I will do it for ya ^o^ hihi!! Superschattige nagels ^^ Ik heb meestal het geduld niet om aan nailart te beginnen! Hoe lang ben je bezig met zoiets? ._. Very cute!! I have to try this out. WAAAH! This is adorablee!! :) You're so good at doing manicures! I wish I was as good as you! Reply to Anouk, michelle, barestudy and hihihi! @Anouk, dank je wel ^^ ! @Michelle, thank you love =D~ you should try ittt !! @hihihi! ahww thank youuu ! ^___^ hmm, i think once or twice a month? I'm not allowed to have nail polish on my nails during work =/ so I need to keep that in mind~ sometimes I just remove it after i did the tutorial, cause I have to work the next day haha xD. Wow! Your nail is a work of art, look time consuming as well. The cloud look so fluffy hehe. I'm so going to have to try this nail tutorial ! It's gorgeous ! ;-D Very creative ! Hi there! You DIY nails is gorgeous! Looks simple to fix and will try it out soon.